This a very good record and the band is from Finland. I have known The Rockadillo label guy, Tapio Korjus, for maybe 10 years. He is involved in lots of different things. He helps bring lots of different kinds of music to Finland and is seriously involved in Finnish Music export situations. He is a smart at wise man. I have seen him in Berlin, Austin, Riga, Amsterdam, NYC, Cannes, Cologne, Hamburg, Denmark, London and probably other cities. He keeps his ear to the ground and works very hard for his bands. I say all of this about Tapio to introduce how I came about to work with Plum. While I was living in DK, Tapio asked me to mix and overdub on some tracks. mostly already done by the band. I had heard of the band while my office in Austin was helping do a promotion work with the Finnish presence coming to SXSW. My lovely assistant Brenda Hutchison was the first one to listen to the CD's they sent ove, listened to PLUM and immediately started playing it in the office all the time. Everybody loved it and they came to SXSW, I saw them play and thought they were cool..... Lisen is a totally cool singer and very believable performer. 3 years later Tapio calls me for the work. I was so happy. Zazza & Tapio came over in the middle of the winter to Samso DK and Dansebjerg Studio. It was raining cold winter rain the 4 days they spent there. Orphan's is one the most moving songs I have ever heard. I even played some acoustic guitar on a song. Some of the songs came out really good. I was really getting into Protools. It was a fun and creative session. Finnish (Suomi) people are the most interesting in Europe to me. They are like cautious Texans. They are patient and persistent. I realize that this is over generalizing, all of the people I have met in the Suomi recording industry have these qualities. 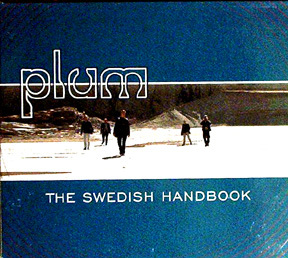 The Plum record came out and it did respectable sales, mostly in Finland. I wish this band would make some waves in this big sea. PLUM is great. Thank you for getting me invovled Tapio!